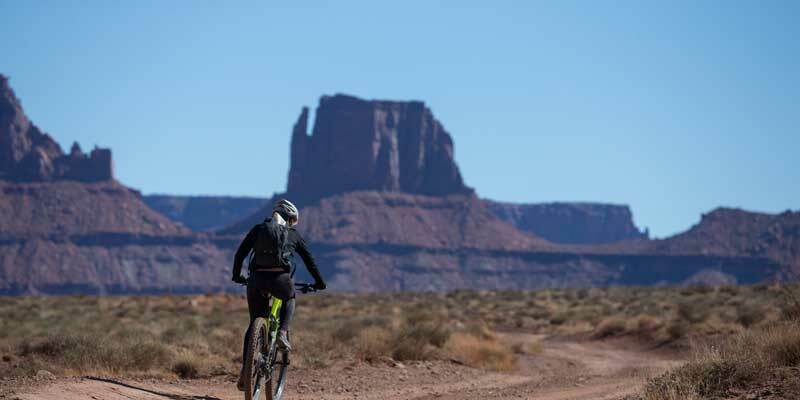 A must in any biker's rites of passage is riding the White Rim Trail mountain bike tour in Canyonlands National Park. Riding on a sandstone bench through a land called "Island in the Sky" you will pass Musselman Arch, Monument Basin, Turks head, Candlestick Tower, and White Crack, a perch 1000 feet above the confluence of the Green and Colorado rivers in the center of Canyonlands... some believe the center of the universe. 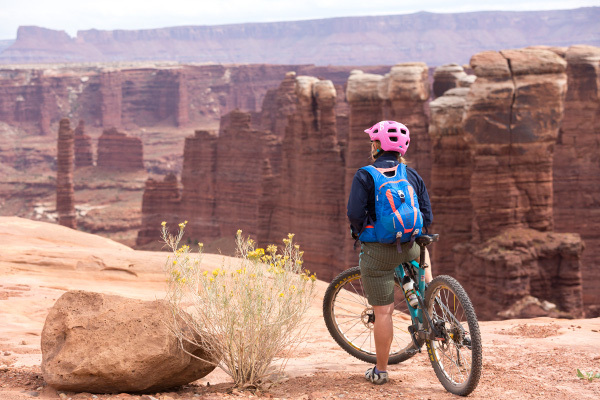 If you only had time for one Moab area multi-day bike trip in your life, the White Rim Trail mountain biking tour should be the one. 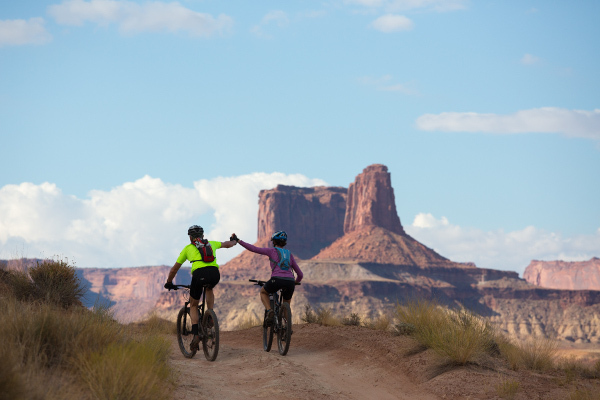 The White Rim Trail trail mountain bike trip can also be combined with the Colorado River through Cataract Canyon for the ultimate 7-day multi-sport adventure vacation. Your guides will bike with you and follow behind with the 4x4 van support carrying all the gear, food, water and extras. You just bike and enjoy the view! 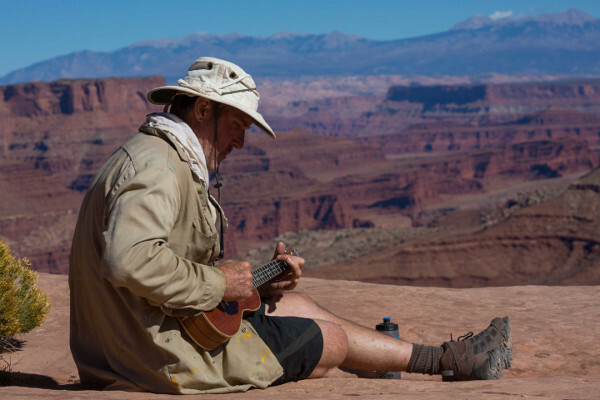 The bike tour White Rim Trail takes you through the "Island in the Sky"
The White Rim Trail Mountain biking tour is located in the heart of Canyonlands National Park. You will enter on one side or the other of the "Island in the Sky" or the land-locked triangle between the confluence of the Green and Colorado Rivers. One of the advantages of a bike trip is the flexibility of the daily itinerary. It can vary widely from one trip to the next based on group desires, Mother Nature, and courtesy for other groups in the area. This typical itinerary illustrates a bike trip through the Island in the Sky District. 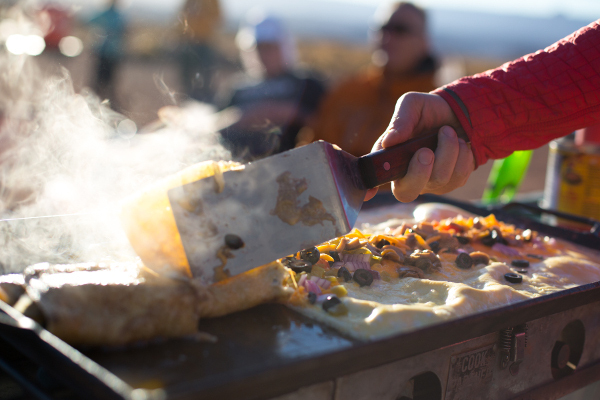 The White Rim itinerary will vary with the time of season, weather conditions on the trip, and scheduling of campsites. Day 1: Meet group at Holiday River Expeditions headquarters (7:00 a.m., Mountain Time), we will issue your bags. You can buy any last minute items from our accessories store at this time (see our packing checklist for a list of items you can find at our store). Before leaving our headquarters, each guest along with a Holiday guide will perform a pre-trip inspection of your bikes. If you are providing your own bike, please make sure that it is in good repair, we recommend a complete service by a professional shop prior to the trip. Guests with bikes’ that fail our inspection will be asked to rent a Holiday bike for $170.00/person. A two-hour van ride to the head of the Shafer Trail marks the start of the trip. The first day's ride will take the group down the switchbacks of the Shafer trail before cutting back south toward Musselman Arch. The trail continues to wind southward as it follows the meandering course of the Colorado River. Camp on this evening is made at (or near) Gooseberry Canyon. Day 2: Our ride will take us over undulating roads past the white, sandstone-capped monoliths of Monument and Twin basins. Then in the afternoon, up to Murphy's Hogback, the first of this trips’ two challenging uphill stretches. After conquering the hill we will set camp for the night. 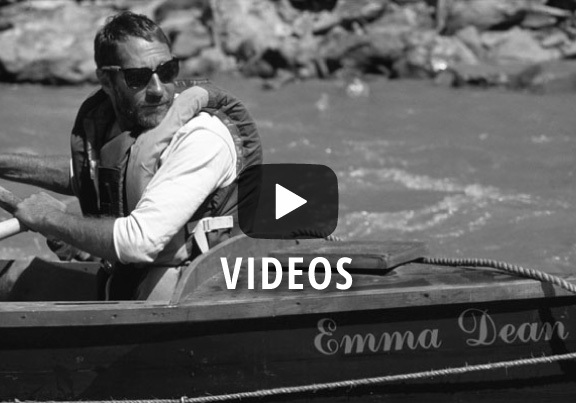 Day 3: By the morning of this day the trail has turned back north and is following the contours of the Green River. We ride around the labyrinths of Soda Springs Basin and by Candlestick Tower before reaching Potato bottom, where we camp for the night. Day 4: This morning we will tackle the challenging Hardscrabble incline and visit prehistoric Indian ruins at a lookout point above Fort Bottom. After descending from Hardscrabble Ridge to river bottom, we will follow the Green River to Mineral Canyon. Our vans will meet us for a 2-hour drive back to Green River. Our expected time of arrival back at our headquarters is 4:00 to 5:00 p.m. Returned yesterday from a 4 Day White Rim Trail Biking Trip! Dustin and Justin made it a wonderful trip for me! I am a 56 years old woman without much athletic experience and a fear of heights. They accommodated my dietary needs and encouraged me during the difficult parts. They allowed me to discuss my fears and gave me great advice. The meals were delicious and side hikes were so interesting. I would strongly recommend this trip for any adult wanting to see Southern Utah the best way!!! This was such a great trip. We took our two teenage children and I was worried they'd whine and complain and they loved it! They had such a sense of accomplishment when they finished and our 15 year old even biked up and out of Mineral Bottom at the end of the trip. Our guides were so helpful. They helped with bike seats, bike peddles and general moral boosting! They knew all about biking, geology, regional history and made the trip a great success. The food was outstanding and healthy. I loved the couscous/orzo salad for lunch on the second day. The guides always had energy bars, granola bars, available for us. Holiday River is always so well organized. Professionally done and such a positive atmosphere. Thank you! !